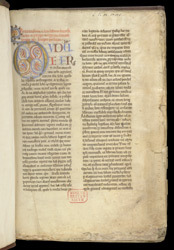 Gregory the Great (c.540-604) was pope (from 590 until his death), reputed inventor of 'Gregorian' chant, and one of the most important authors of the early Middle Ages. His Commentary on Job is a vast work, running to half a million words, divided into 35 books, and is bound in as many as six volumes. This manuscript contains Books 17-35, and was therefore presumably the second half of a two-volume set that was apparently owned in the Middle Ages by St. Mary's Priory, Bradenstoke (between Swindon and Chippenham). The volume opens with a preface to the entire work, decorated with a fine initial 'D' enclosing palmette ornament. The scribe has arranged the first lines of text to allow for the curved shape of the initial, and he may also have been the artist.